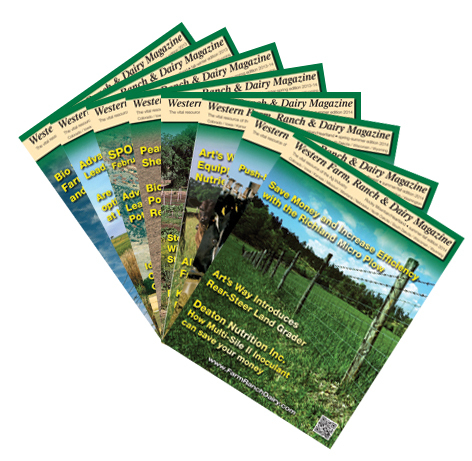 Western Farm, Ranch & Dairy Magazine is published quarterly and covers eighteen states with two regional editions. Western Farm, Ranch & Dairy Magazine is a full color 8 x 10 magazine. We normally run 40 percent advertising to 60 percent editorial copy including business features, industry, regional and national news. Full color, spot color and black & white is available for all display ads. In addition, we offer one free color for any ad 1/4th page or larger. An adddition benefit included with your paid ad is a hyperlink which we place on our website to direct traffic to your website. Our publications are distributed by U.S. Mail and FedEx ground to our subscribers, advertisers and also to distributors such as feed stores, farm implement shops and other ag centers. In addition to physical distribution, our publications are available on this website for download. This online feature increases your business exposure thereby maximizing your advertising dollars. At Western Farm, Ranch & Dairy Magazine, we work hard to provide a comprehensive view of all aspects of the ag industry. This extra effort makes Western Farm, Ranch & Dairy Magazine the vital resource it is an effective advertising vehicle for your business. Western Farm, Ranch & Dairy Magazine is one of the best investments you can make when it comes to spreading the word about your business throughout the Western United States farming and ranching community.